One of those things that make chemistry interesting: chemicals often come with a distinct smell, good or bad. In a recent Organic Letters publication ko, Savage, Williams and Tsanaktsidis (DOI) present the Barton decarboxylation as an organic reaction involving chemicals producing a particularly bad smell but fortunately for this reaction they have found a solution. 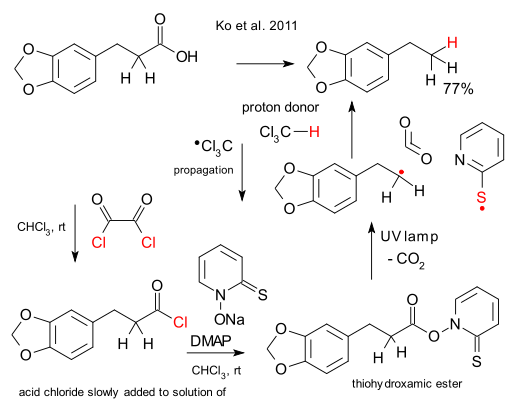 The decarboxylation reaction in general is based on the reaction of an acid chloride with 1-hydroxypyridine-2(1H)-thione to form a thiohydroxamic ester which on irradiation loses carbon dioxide generating two radical fragments. The carbon radical then grabs a proton or halogen atom from a suitable source and decarboxylation is a fact. A proton donor usually is tributyltin hydride which makes the reaction expensive and with a tin-sulfur spent reagent also smelly. The authors make it very clear that their novel hydrogen donor replacement compound was stumbled upon by accident and not the result of any clever reasoning, computation modeling or sheer genius. They were in fact looking for ways to replace carbon tetrachloride as a chlorine donor by chloroform. To their surprise chloroform surrendered not chlorine but hydrogen. In their new protocol chloroform is both solvent and reagent without the need of working up intermediates. Only drawback: the acid chloride has to be added slowly to the thione solution because chloroform is less efficient in hydrogen transfer than the tin hydride.